Does Valencia enjoy the best climate in Spain? These past few days, the region seems like it could take the European title! 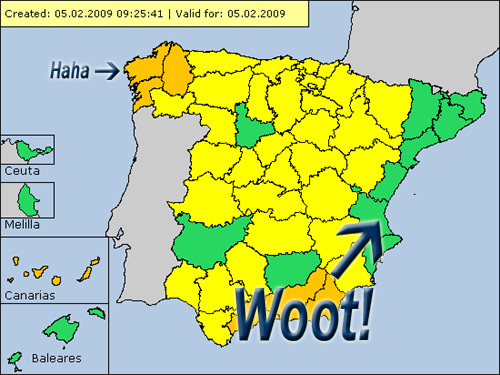 As the rest of the continent has been hammered by vicious snow and rain, Valencians have been able to stroll their streets in sweaters and sunglasses. I took a siesta in the sun yesterday, for heaven’s sake. And to think… we nearly moved to Bilbao. The average maximum temperature in February is 17° Celsius (62.6 F). But, more than the temperature, it’s the sun’s stubborn insistence on shining that truly makes the weather here tough to beat. 300 days of sunshine a year is the generally accepted number. The weather… just another reason to love this city. All the spanish I know have been complaining these last days that it’s too hot. I’ve been finding it really humid, quite uncomfortable, sticky, makes sleeping difficult too, sadly I dont have air con. Am I the only one that finds too much heat restrictive?! The most amazing thing to me is that in winter it snow all over the place and in Valencia never. At least not last winter 😉 Knock on wood! But Snow would be amazing! Nothing wrong with a bit of cold season defining weather.